A good pair of sublimated baseball pants is sometimes forgotten, while the cool-looking customized jerseys get all the spotlight. But they are just as important — after all, without them, you can’t complete your sublimated baseball uniform. In order for your whole team to shine their brightest, they will need the perfect pair of baseball pants. On one hand, it would be a waste to get customized, professional-looking jerseys and then wear sub-par, cheaply made pants. Where would be the logic in that? The strongest baseball outfits are made up of two pieces: a flashy top and comfortable but stylish pants. Who could forget the very important comfort factor? To be able to give your best on the field, you need the right attire, and our sublimated baseball pants have been designed to fill that need. They’re not heavy, allow for plenty of movement, yet they are sturdy. So you can rest assured that even if you have to throw yourself on the ground to make it to the base, they will last you a long time. Our pants are perfect for all teams. You don’t need to be an all-boys or all-girls team, nor do you need to be competing at a specific level. All our sublimated baseball pants are tailor-made for each team. Find what size will suit your team the best and then get in touch with us so we can arrange everything! We can cater to just about any team. 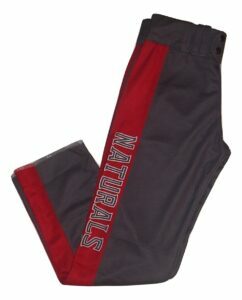 We even carry pants that are perfect for Little League baseball uniforms! If you want to take your team to the next level, investing in a high-quality pair of sublimated baseball pants is the right decision.